It’s time again to visit everyone’s favorite Girly-Girl Murder Machine, She-Ra! Well, She-Ra of the minicomics, where she turns her enemies into butterflies or stone walls. And this isn’t even the version fighting a civil war against an evil army. This is the She-Ra that in past installments we’ve seen play dress-up and fight Catra over jewelry and boys (namely Bow). Okay, Catra took over Bright Moon once but I’m not convinced it was for any reason other than being jealous She-Ra has the Crystal Castle and wanted a dream house of her own. Most of these stories feel more like they’re in high school and Catra’s just the mean girl, yet this She-Ra has the higher body count than the one actually fighting a war in the cartoons. 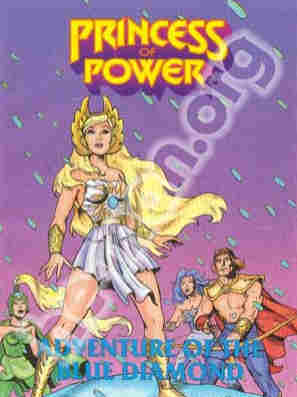 This is the last of the “series one” Princess Of Power minicomics, so who know? Maybe this time we’ll finally get a real case of our mighty heroine working to save the world from imminent danger…okay, I just saw the title, and they’re fighting over jewelry again. Girls, you were not getting the good stuff compared to your brothers. I’m sorry. Well, maybe something amazing will still come out of it. Or maybe She-Ra will butterfly another creature for being ugly. I really hope the new cartoon is only looking to the old one for inspiration. I mean, I doubt it given what I’ve heard so far but at least it isn’t the minicomics. And not a single one of them has a winter coat. Bow doesn’t even own a shirt. Adora concludes her daily royal duties because she’s still a princess around here in this continuity. Although given what little we’ve seen of minicomics Adora/She-Ra doing actual princess stuff compared to doing stuff little girls think princesses do I’m betting it involved dancing in pretty dresses or something more than actually doing ruler stuff. Kowl shows up proclaiming doom and gloom like the Anti-Monitor is in town, but outside of dark cloudy skies and a familiar catgirl hiss I don’t see anything all that bad. Then again, it could be the artist getting things wrong again because he still can’t draw Adora and She-Ra looking any different. Seriously, if you think He-Man and Adam look too similar pick up a Princess Of Power minicomic someday. Because a blustery day is no fun She-Radora calls her friends Bow and Double Trouble to help her find the cause. Admittedly I don’t know who Double Trouble is and a quick check tells me why. Apparently the show bible (maybe I should look that one up some time after I finish the Star Trek: The Next Generation bible, especially with the new show coming) does mention her, as a double agent using various guises to spy on the Horde and pretend to be a sympathizer but really working for the Rebellion. But for whatever reason nobody could think of an episode for her and she was never on the show. This is her only appearance, and we’ll have to see if any of that factors here. I’m betting no, because thus far these stories have been more bizarre than good, but her disguising ability is what’s being called on here. I wonder if she and Man-E-Faces compare notes? The deal is that Double Trouble is to sneak into Catra’s base and find a way to send a signal to the others, who will come to the rescue in their Flutter Plane. And here’s where things get confusing on the toy side, at least according to Wiki Grayskull. The Flutter Plane comes from the cartoon, but there is a butterfly themed plane called the Butterflyer in the toyline, and I’m sure at least one of them was a normal plane She-Ra magic-ed into a butterfly because it was ugly. Is it possible the toy was going to be called Flutter Plane but Mattel later went with Butterflyer? Well, Butterflyer did show up in the show but it looks like the thing has actual skin based on the coloring. You know, the further I fall down this rabbit hole the more He-Man’s sister scares me. …”transformation” is a loose term. It’s more like she changes facial expressions. The artist is terrible at drawing alternate forms. I’m glad he, she, or they didn’t work on Transformers comics. You’d probably see Optimus Prime roller skating and everyone calling it his semi truck mode. But because transformations in this minicomic make every argument about Prince Adam look weak in comparison, Catra buys it and tells her good friend Double Trouble how she made things a bit more annoying using Frosta’s wand accessory. Apparently the heavy winds we saw was supposed to be Etheria freezing over, but it’s only temporary unless Catra use Frosta’s map to find the Blue Diamond. At least this time the jewel is dangerous and not some dress-up set Kowl found buried in their vegetable garden. Double Trouble manages to signal She-Ra and Bow after Catra leaves. Frosta tells them about how she was so lonely that Catra easily tricked her into being friends and spilling her secrets. Thus you see the advantage I have as an introvert who responds poorly to pressure by pushing back. Luckily Frosta remembers the way to the Blue Ice Diamond and leads her new friends to it, but Catra’s already found it and dear god that expression! Well, there’s your nightmare fuel. Catra exclaims that she will now rule everything…which is great if you want to rule Hoth, but this is Etheria and I’m starting to think Catra didn’t think this plan out very well. That or she plans to make a fortune in snow shovels. At this point I put nothing past these minicomics. Frosta freezes Catra, so I guess that’s what our mom’s meant about our faces staying that way, but the “daystar” (apparently they don’t actually call it their sun but use the same term as the dinosaurs in Land Before Time) is already…in an eclipse. I don’t follow what’s happening here. But She-Ra has a plan. She breaks the holder it didn’t have until she was ready to cut in half with the Sword Of Protection, straps the diamond on Bow’s arrow and tell him to fire it at the eclipse to unleash the magic. If I have to explain everything wrong with that last sentence you are still in elementary school. And after a short suspenseful wait (credit where it’s due, it’s a good two panels) the sun is alive again and all the ice melts. Catra just walks off and leaves the cape behind in a puddle of her own ice and nobody makes a move to stop her. Geez, at least when Skeletor and Hordak escape in the Masters Of The Universe minicomics it’s because they teleport away before He-Man and friends can nab them. So now Frosta has good friends, moral is given, the end. There was easily more to make fun of in this story but critically it isn’t all that bad. Most of the problems come from the artist not showcasing a snowy day or transformations very well plus how science takes it in the rear but that was 80s kids properties for you. At least this time Catra was an actual threat to our heroes. It’s no “Magic Stealer” but Etheria does seem to be in dire circumstances and our heroes need to come up with a solution. Compared to what we’ve seen in previous Princess Of Power minicomics I’ll take it. At least She-Ra doesn’t kill anyone, although I’m not convinced the butterfly plane wasn’t a person once. You can read it yourself at He-Man.org or the recently released Dark Horse collection of all the He-Man and She-Ra minicomics. While this is the end of series one, there are still more Princess Of Power minicomics to come as there are two more series of minicomics to go. We won’t be saying good-bye to Etheria any time soon, but we are going to leave for a bit and head back to Symbion to see what the Sectaurs are up to in our next minicomic adventure. Posted by ShadowWing Tronix on October 3, 2018 in Free Comic Inside and tagged Bow, Catra, comic review, Double Trouble, Free Comic Inside, minicomics, Princess of Power, She-Ra. I look forward to the Sectaurs mini-comic reviews. 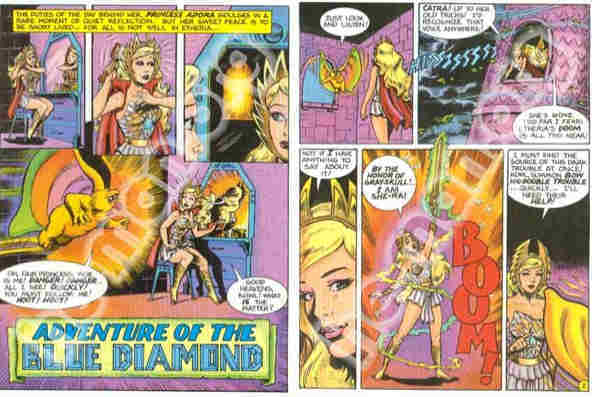 Based on what I’ve been seeing here, it doesn’t seem like the She-Ra mini-comics are top quality. Was the cartoon better than the mini-comics? As good as the He-Man cartoon. Then that means the 80s She-Ra cartoon was top quality because the 1980s He-Man cartoon is always placed on various “top cartoons of the 80s” lists that one can find online.